Lysa & Huey Ink! 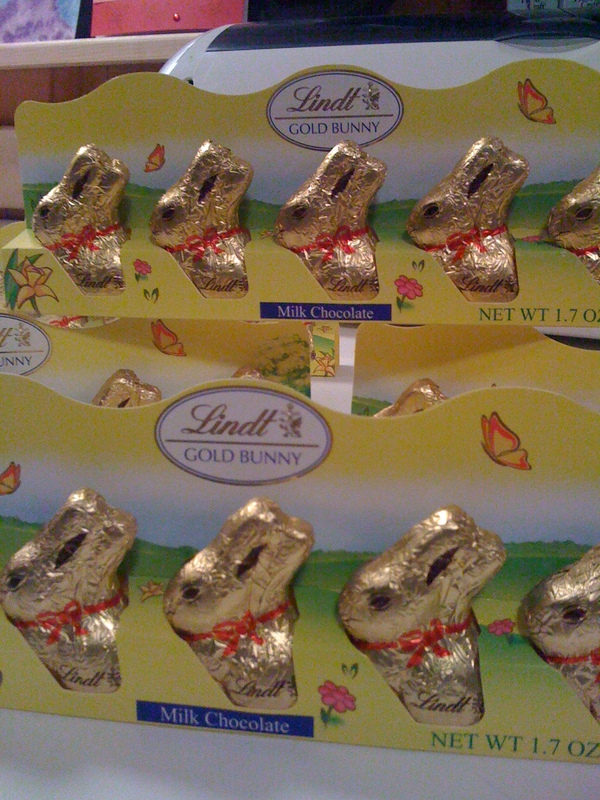 : Lindt Bunnies - I Love 'Um! Oh my gosh, I am so happy that it is March!! This is the month that I start thinking of all that nice weather that is coming down the pike. 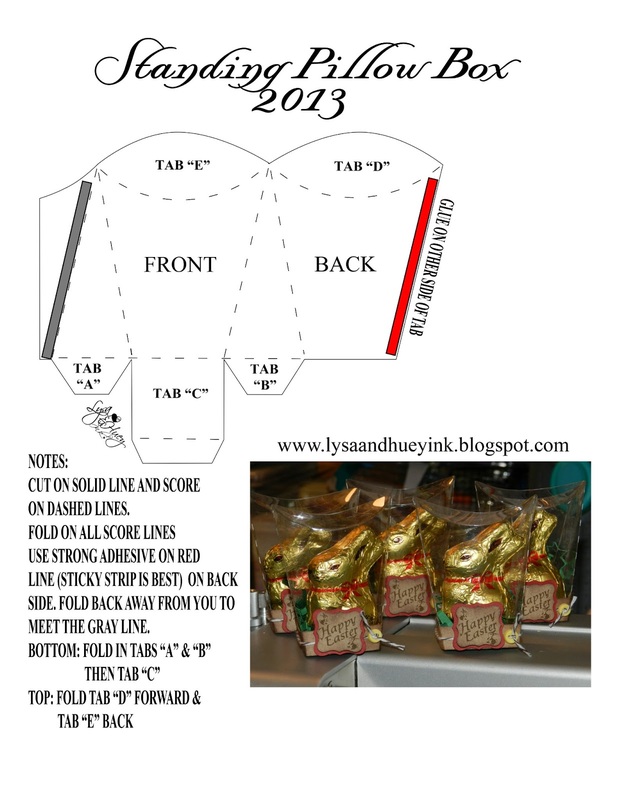 Oh yeah, spring, St. Pat's parade day, open windows, Easter and oh those little Lindt bunnies that I love so much. 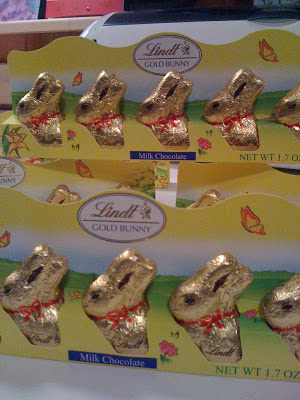 By far these little guys are the most perfect chocolate bunny to give to children and adults alike. It's the size, they are tiny. A little 2 bite of Easter Bunny love! Now I have used these little guys for years. I just love to re-package them. 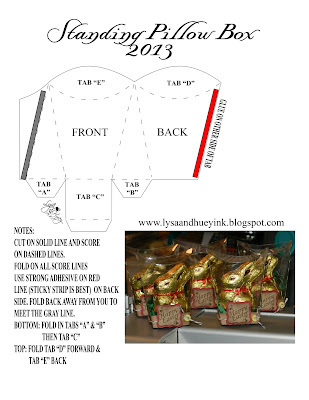 If you click on my Bunnies or Easter label you will see them all. So this year I wanted them in a clear package. Last year was a basket. I have so many plastic report covers that if I don't start using them they will take over. I had used a regular pillow box back at Christmas and I wanted to change it up a bit. I kept seeing these standing pillow boxes that were made with a Sizzix die. Well sure enough in my research I come to find out that they no longer make the die. That then led to looking for a picture of one. It took a long time to find one. If I can see it, I can draw it. Once I got the shape and the score lines worked out it was easy to size it perfectly for the little bunny. I left just enough room for a bit of green paper grass. Here is a picture of the first group. Don't they look happy sitting in their little plastic box! The plastic covers cut perfectly with my ZING. I left the score lines because it was easier than hand scoring. I am so happy with how easy and quick they went together. Now to make more! The fold may look a bit confusing but once you have it cut and in your hands you will see how easy it folds together. If you have any problems, just leave me a message and I will do my best to assist. Here is one more picture of how happy they look! I hope you like this file as much as I do. Feel free to resize and alter to your needs. If you like it as much as I do, won't you take a moment to leave me a message and some bloggie love. It really is all I need to keep me sharing files. Thanks for stopping by for a visit. Next up on my craft table is an odd project that isn't paper, this time it's brick! Thank you so much for this wonder Bunny holder. My daughter makes a trip to Montreal every year just to bring back Lindt chocolate for all of us!!! Just an awesome box, thanks so much, love your creations!!! Thank you so much Lysa, so cute!! Thanks so much for your kind words. The tag on the box is made in CraftArtist 2 and punched out with the new Stampin' Up mini curly label punch. When I get a new punch I scan the shape in to my MTC and create the shadow for it. I have a shadow for every punch I own. I am sorry I can't share the egg file as I purchased that from Paperthreads years ago. I can't remember the artist name but Michele is on the MTC forum and she may still sell it. I had also bought the apple. I love both those files and use them a lot. Also you can search google for one. They are called "sliceforms" There is a free one on extreme cards but it is not hollow. Check with Michele to see if she has it for sale. I hope this helps.